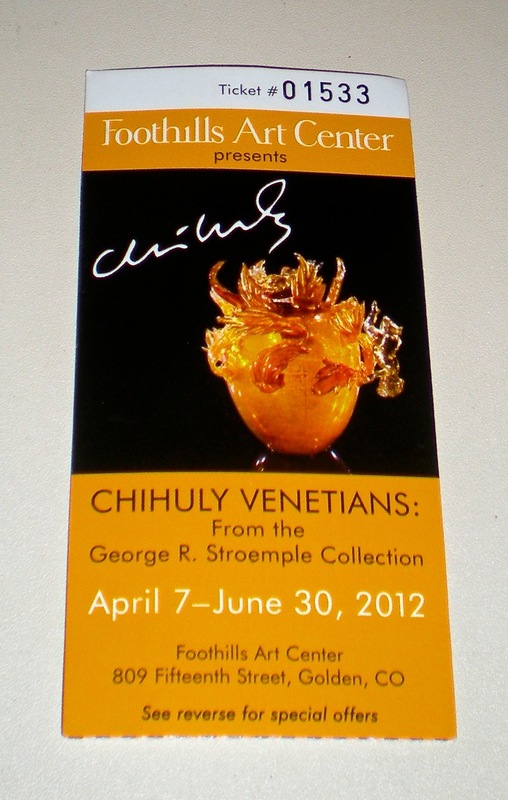 The ticket says Chihuly Venetians through June 30, 2012. Golden’s Foothills Art Center has hosted the Stroemple collection of Dale Chihuly’s dramatic art glass since early April. Those who have missed this special show have a second chance until July 15th. We’ve sought out Chihuly works and exhibits in West Palm Beach, Tacoma, Oklahoma City, Loveland, Spokane, Albuquerque, Phoenix and Colorado Springs so couldn’t miss this one much closer to home. Even though the Venetians are not quite my favorites of Chihuly’s series, visiting the Foothills Art Center show proved enlightening and inspiring. Fascinated after watching the creation process on the 18-minute, continuously looping, video I felt compelled to walk through the exhibit a second time, appreciating the incredible artistry, detail and skill. The Laguna Murano Chandelier with over 1500 separate glass pieces arranged in five elements highlights the exhibition. Colorado citizens and visitors are fortunate to have two more weeks to see Chihuly Venetians. Not All of Colorado is Burning! Not to downplay the seriousness of the multiple fires that are currently underway and receiving massive publicity, but be aware that there are many areas of the state untouched by the tragic flames. 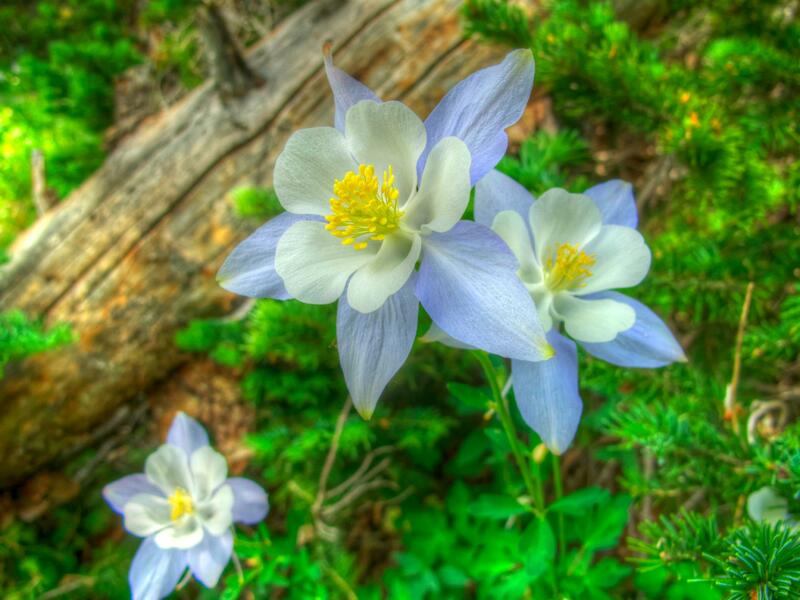 Mountains stand tall, wildflowers are in bloom and communities eagerly await your visit. 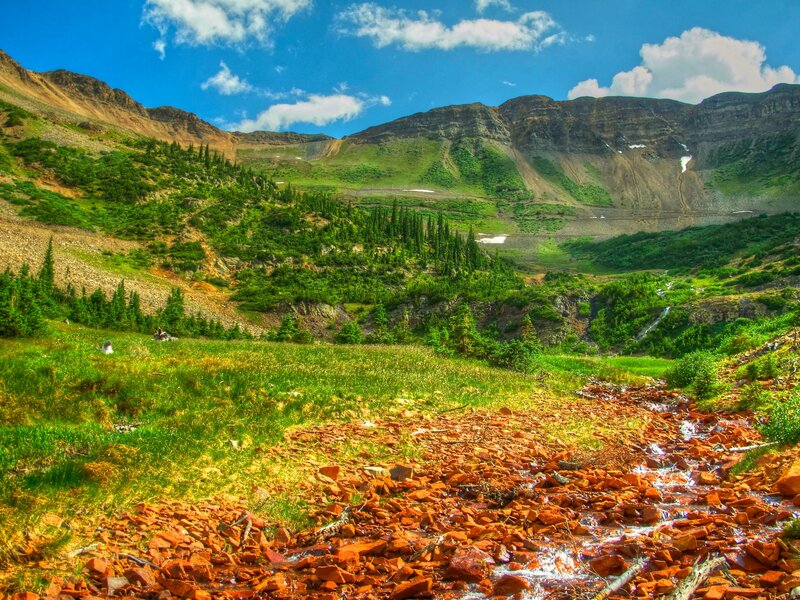 I share a few photos taken by Eric Yackel on Tuesday, June 26, 2012 in the West Elk Mountains southwest of Crested Butte. More than ever Colorado appreciates and needs all the positive effects of tourism. Want to help? 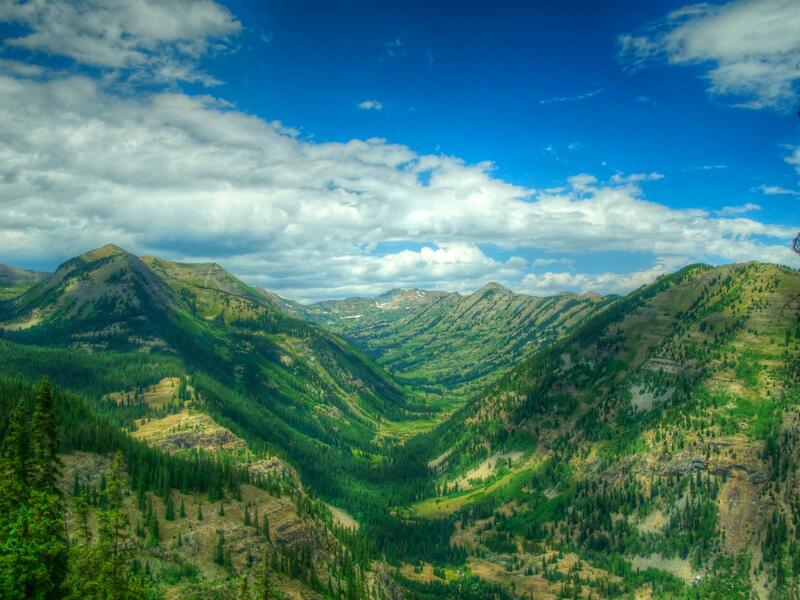 Include Colorado in your summer itinerary. 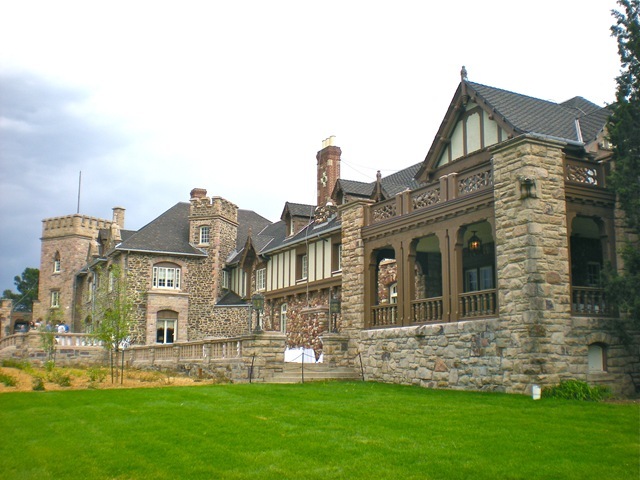 After a highly successful grand opening and dedication the renovated Highlands Ranch Mansion opens to the public on a regular schedule June 26, 2012. Shea Homes conveyed the Mansion to the Highlands Ranch Metro District and provided six million dollars for renovation as well as establishing an endowment for future upkeep. Massive work projects began in 2010. The completed project including a new 5,000-square-foot event pavilion, was unveiled to the community June 8th. 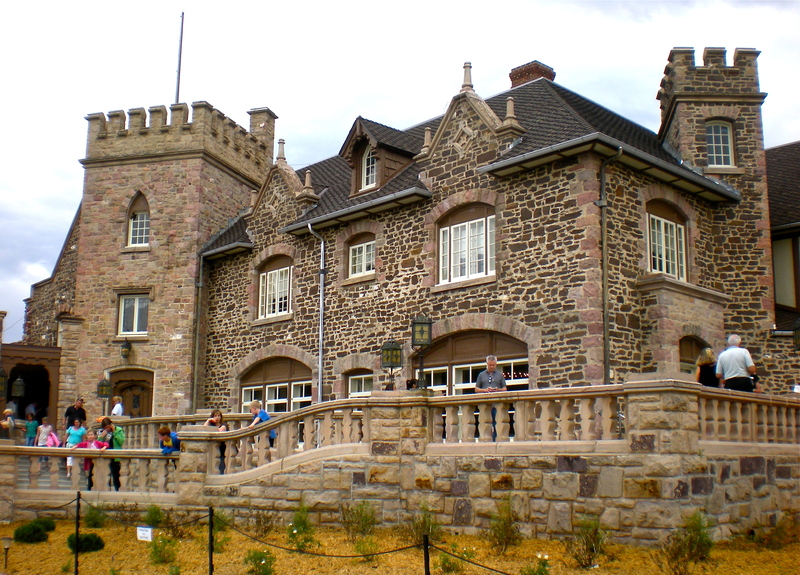 Beginning June 26 the mansion’s doors swing open on Tuesdays and Thursdays from 10am to 3pm. A brochure will be available for self-guided tours of the first floor and several of the historic rooms on the second floor. Guided tours will become available at a later date. Check the website for select public weekend dates. No admission is charged during open public hours. 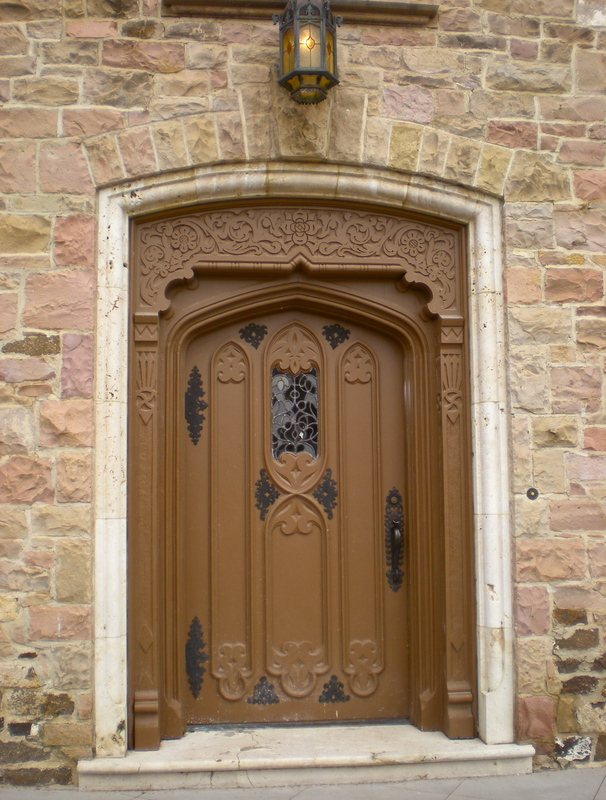 Wander through the refurbished rooms, admire the craftsmanship and detail or picnic on the lawn. For the first time in 30 years furnishings appear in many of the mansion rooms. The Highlands Ranch Park and Recreation Foundation continues fundraising to purchase additional furniture and art work that reflect the mansion’s earlier eras. The Highlands Ranch Mansion, Carriage House Pavilion and back yard are available for weddings, private events, business meetings and conferences. Association, admission charged for both events. The often enlarged and altered domicile dates back to the 1880s when Samuel Allen Long (re-enactor let) built a simple farm house on his homestead acres and named it Rotherwood. Succeeding owners of the home and expanding ranch land included politicians, Confederate colonel, bankers, oil entrepreneurs and businessmen – John Springer, Colonel William Hughes, Waite Phillips, Frank Kistler, Lawrence Phipps Jr. At one time the property was thought to be the largest ranch in Colorado. Prominent Colorado business leader, Lawrence Phipps Jr. owned the ranch from 1937 until his death in 1976, naming it Highlands Ranch. The Mission Viejo Company purchased the property in 1978, beginning the creation of a new Douglas County community that today has a population of nearly 100,000. 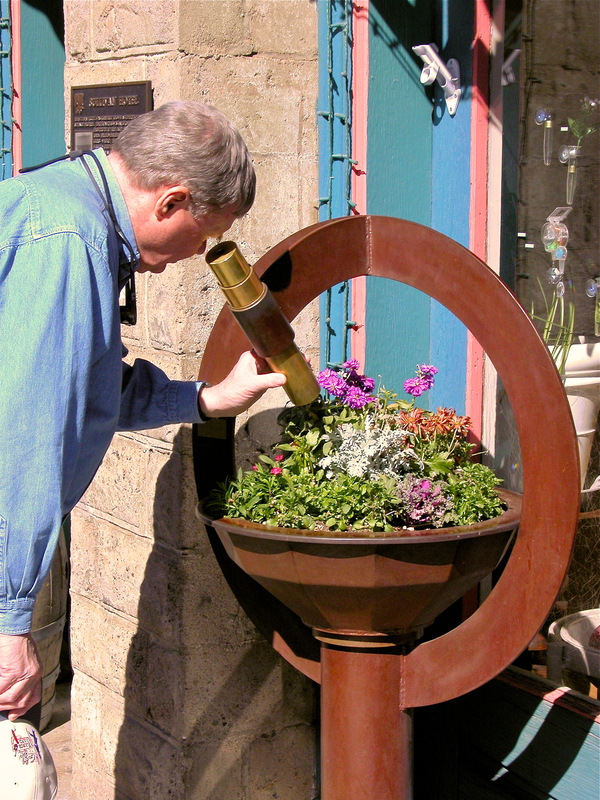 Laying claim to the title of world’s largest kaleidoscope shop Nellie Bly in Jerome, Arizona opens a colorful and dazing world to visitors. 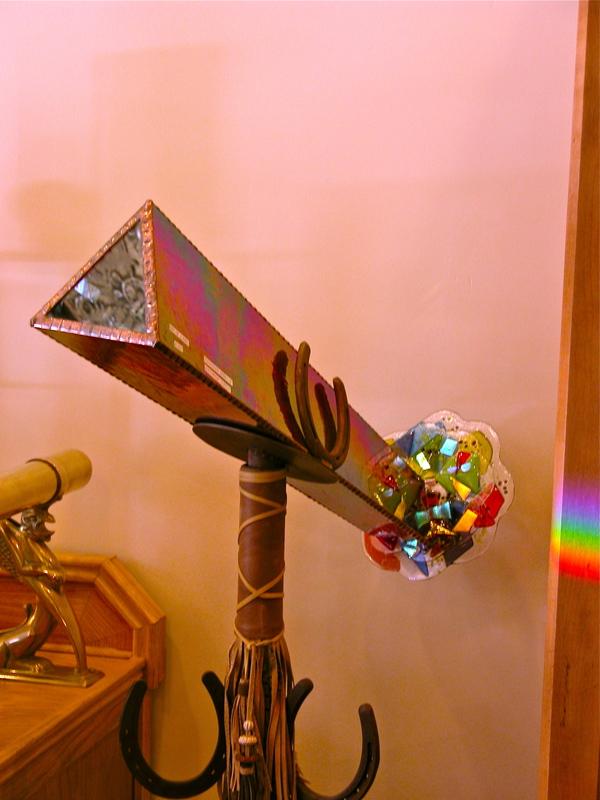 Even before one steps through the doorway the wonder starts with a kaleidoscope prism aimed at a planter of bright blossoms – just give it a spin. Once inside, the vast array of “scopes” astounds – everything from pocket-sized selling for only a few dollars to massive works of art costing thousands. Shopping here is a definite hands-on experience, or rather an eye-on experience. Whether it’s in the form of a necklace or a floor model a knowledgable staff shares info about the artists, designs, optics and mechanics. Nellie Bly represents more than 90 artists and stocks literally hundreds of kaleidoscopes in addition to original art glass and jewelry. Jerome once had the reputation as Wickedest Town in the West and grew to a copper mining town of nearly 20,000 in the 1920s. 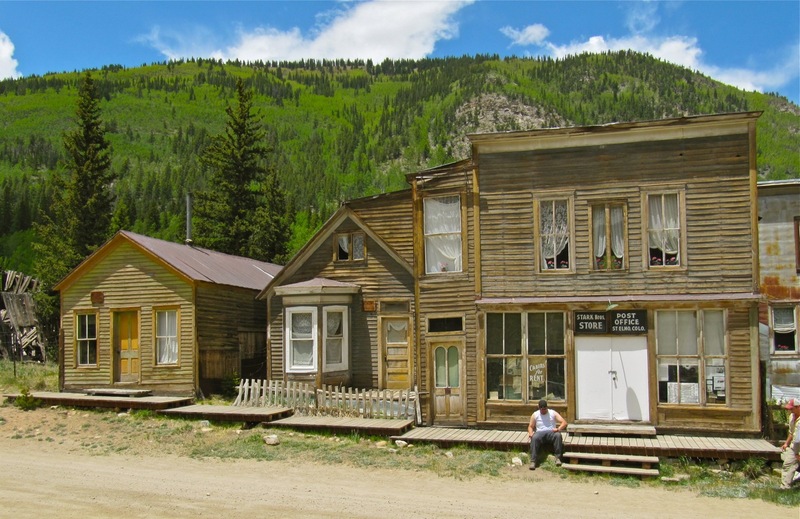 After the mine was closed in 1953 Jerome virtually became a ghost town. 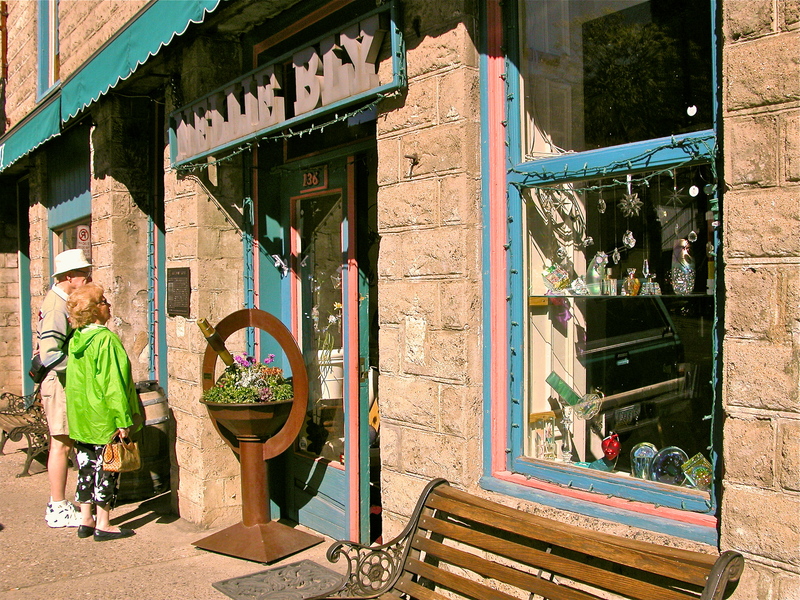 Today the town 27 miles southwest of Sedona attracts visitors to its National Historic District and active artist community. Nellie Bly is a bedazzling reason enough for a trip to Jerome. To see Lake Powell one needs to get out on the water. Many who arrive without their own boat plan to rent – anything from a 75-foot houseboat to a SUP (stand up paddleboard). 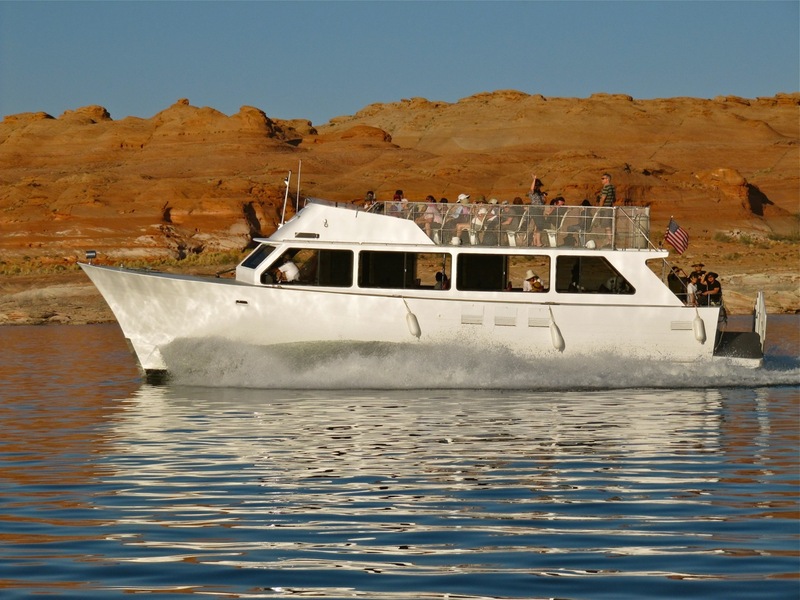 If time is limited or you want someone else to be in charge take one of the guided scenic tours available from Wahweap Marina at Lake Powell Resort (near Page, Arizona). Antelope Canyon Boat Tour – 1.5 hour trip into perhaps Lake Powell’s best know canyon. The Navajo Sandstone walls squeeze closer and closer together as the boat goes deeper into the canyon – to the point you feel like you could reach out and touch the towering walls. Canyon Adventures Boat Tour – 2.5 hour tour exploring Antelope Canyon and Navajo Canyon known for sheer walls ladened with "Navajo Tapestry". 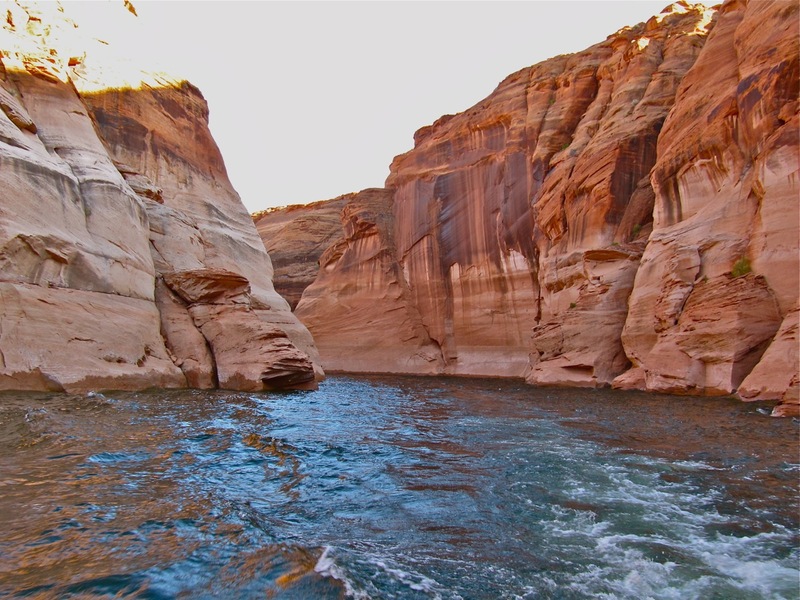 Rainbow Bridge Boat Tour – 6-hour, 50-mile trip to Rainbow Bridge National Monument. After two hours of travel time the boat docks so that passengers can make the 1.25-mile (round trip) hike to view Rainbow Bridge. The natural sandstone span is the world’s largest known bridge, standing 290′ tall and stretching 275′ across Rainbow Canyon. Neighboring Indian tribes believe Rainbow Bridge to be a sacred religious site, saying special prayers before passing beneath the Bridge. Failing to say the appropriate prayers is believed to bring misfortune or hardship. Say your prayers! Canyon Princess Dinner Cruise – 2 hours, relax with a glass of wine and dinner as evening creeps across the lake. With luck a colorful Arizona sunset will cap the cruise evening. 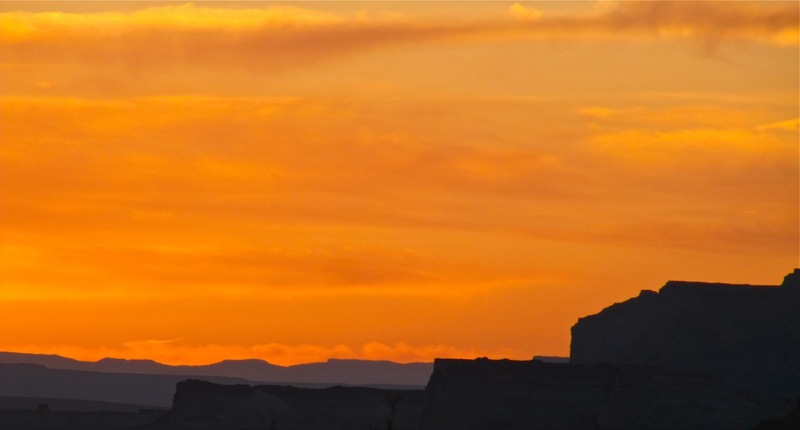 For additional information, schedules, costs and reservations check out www.lakepowell.com. A broken wagon wheel first brought artists Ernest Blumenschein and Bert Phillips to Taos in 1898. 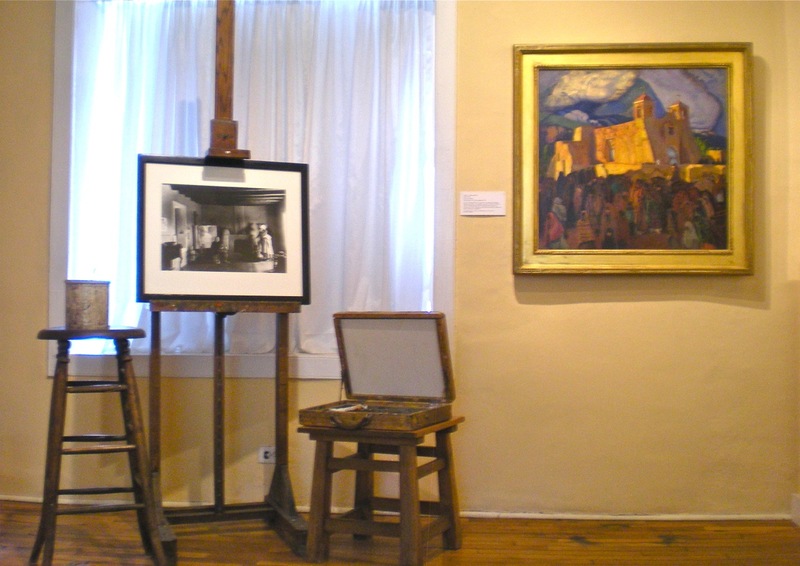 As one of the founders of the Taos Society of Artists in 1915 Blumenschein help establish the northern New Mexico village as one of America’s great art colonies. Blumenschein’s home and studio on historic Ledoux Street in Taos remains much as it was when the family lived in the rambling adobe. 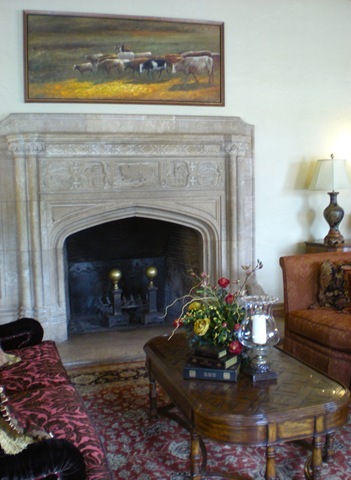 The Blumenschein family’s European and Spanish Colonial antiques and original art fill the museum/home. The MAT combo ticket is valid for one full year and is transferable. 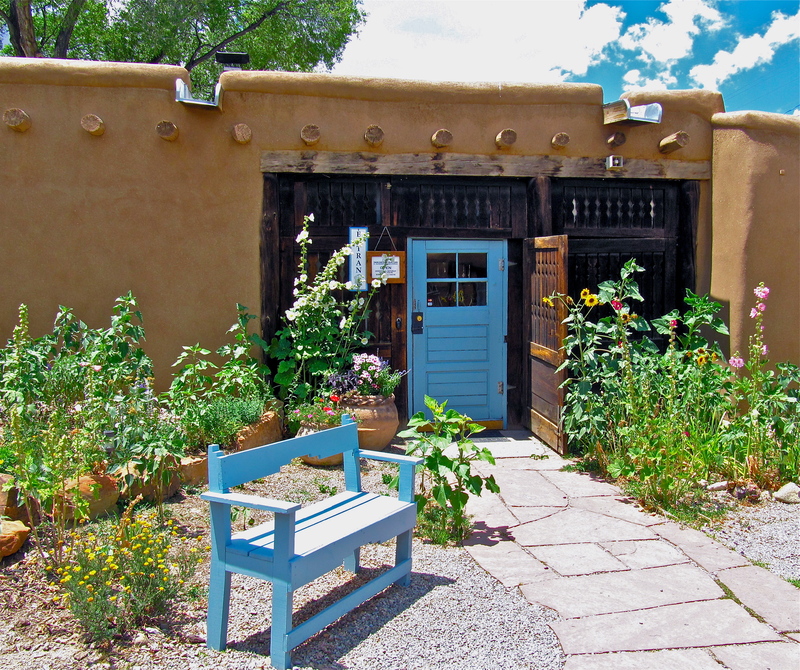 If you can’t see all five museums during your Taos visit you can pass it along to a friend. 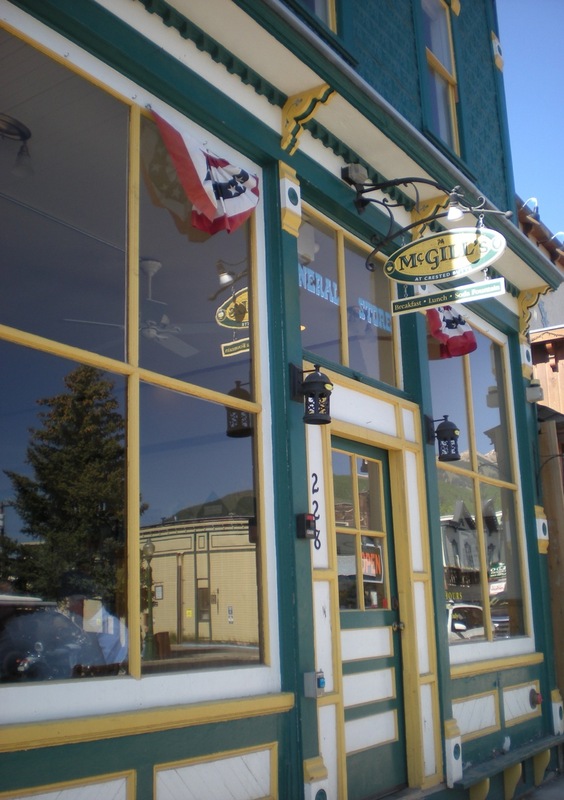 The final day of our 17-day Canyon Country trip started with the best Crested Butte breakfasts. McGill’s is located downtown on Elk Avenue. I selected one slice of French toast and sausage patties. McGill’s French toast is dipped in cinnamon sugar before going on the grill. The sweet, crisp crust is perfect. The thick cut pieces makes the one slice serving all I could handle. Eric ordered the breakfast tacos served with hash browns. The tacos looked terrific and I noticed they disappeared even more quickly than my French toast. We head to Denver via Cottonwood Pass, while we’re use to the 14-miles of gravel road on the west side of the pass we didn’t know that miles of the road east of Harmel’s Resort is under major construction this summer. Delays were not an issue since this was Sunday but the rough, dusty, slow surface would make us consider the longer Monarch Pass route this summer. Cloudy skies and a few sprinkles accompanied us all the way to Buena Vista. We decided to make a side trip to St. Elmo 20 miles southwest of Buena Vista. 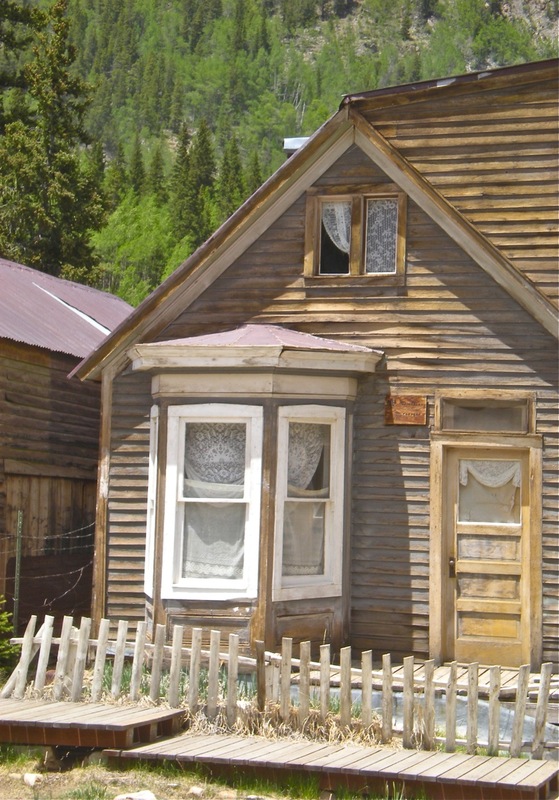 On the National Register of Historic Places St. Elmo is known as one of Colorado’s best preserved ghost towns. 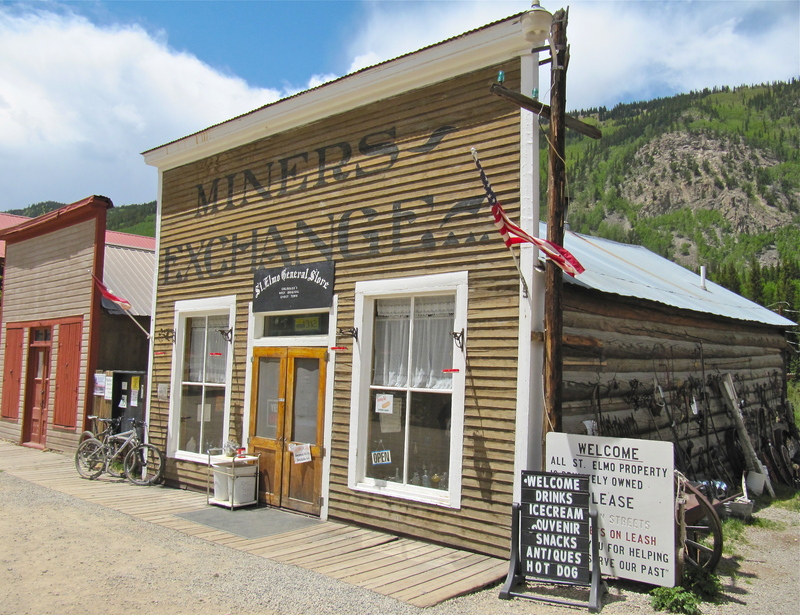 Founded in 1880, the town grew to 2000 residents – mostly gold and silver miners. All the remaining buildings are in private ownership and are in various degrees of repair/disrepair. 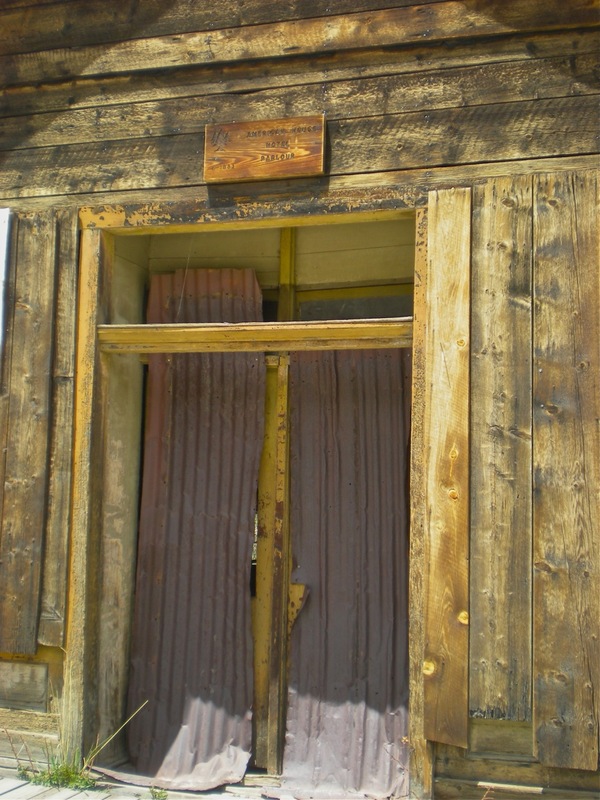 The original Town Hall burnt down in 2002; Buena Vista Heritage has built a replica complete with jail cell in the rear. The St. Elmo General Store opens from mid-May to October offering an eclectic mix of antiques, souvenirs, ATV and cabin rental, cold drinks and ice cream bars.